Coolidge tried valiantly to get along with members of Congress. He was solicitous of the suggestions on legislation and appointments of the Republicans on Capitol Hill. Moreover, he would listen to Democrats who sought his ear. He was cordial to most members of Congress, even to many who embarrassed and opposed him. And the Coolidges so often played host to senators and representatives that the White House sometimes resembled a congressional club. Yet, however shrewd the president was in administration and electoral politics, he was seldom able to achieve harmony with Congress. This was in part the result of the unfavorable impression Coolidge had made on senators during his lackluster vice presidency. More important was the independent nature of Congress during the 1920s. This, of course, had contributed significantly to the uproar over Teapot Dome and related matters that poisoned relations between president and Congress in 1924. There was also the Republican leadership upon which Coolidge had to rely. Initially, there were the independent Henry Cabot Lodge in the Senate and the genial Speaker Frederick Gillett in the House, both from Massachusetts and both aging. Lodge was no longer a very effective leader and Gillett never had been. In 1925 the congressional leadership passed to Senator Charles Curtis and Speaker Nicholas Longworth, who proved to be more effective than their predecessors, though seldom outstandingly so. Vice President Dawes was of little help. The president regarded him as too independent, and because of his strong opinions, the senators viewed him with suspicion. As time passed, Coolidge became adept at making friends on Capitol Hill, but he was often unable to convert them into significant legislative allies. Many Democrats and progressive Republicans were unable to forget the scandals of the Harding presidency. Neither could they support the policies of the Harding and Coolidge administrations. For many of these members of Congress, not only had the government pursued economy too far, but its farm and business policies were bones that stuck in their throats. The administration's tax rebates to business, attempt to allow private development of Muscle Shoals, conservative appointments to office, and staunch opposition to a veterans' bonus and to the proposed McNary-Haugen farm legislation—which would have authorized federal purchase of surplus farm commodities at parity and then resale of them abroad at lower prices—had already been points of conflict with Congress in 1924. These issues would return, in one form or another, to plague Coolidge throughout his presidency. Coolidge would enter his second term in 1925 with a larger Republican majority in Congress—sixty in the House and sixteen in the Senate—which would prove to be of no immediate advantage to him. First of all, after the 1924 elections he had to face a lame-duck session of the Sixty-eighth Congress. The president made it clear that he had abandoned none of his legislative goals, which did nothing to mollify his opponents. Moreover, Coolidge did not discourage the Senate Republicans from reading out of the party caucus and stripping of their committee seniority Robert M. La Follette and three other Republican senators who had supported the Wisconsinite for president in 1924. These senators and their several sympathizers in the upper chamber would repeatedly embarrass the administration during the next four years. Early in 1925 the dissenters helped deal the president two major setbacks. Most notable was the passage of Senator George Norris' legislation providing for public development of Muscle Shoals. Although there would be no action on this authorization during Coolidge's presidency, the administration was unable to gain congressional support for private development of the area. Eventually, in 1933, the property became the centerpiece of the Tennessee Valley Authority. The second problem arose with the president's nomination of Charles Beecher Warren to become attorney general. Earlier Coolidge had easily secured confirmation of William Jardine, an agricultural scientist, to become secretary of agriculture and had encountered some senatorial opposition to his appointment of Attorney General Harlan F. Stone to the Supreme Court, but in nominating a longtime representative of the sugar trust, he presented Democrats and progressive Republicans with a perfect target. Not only did the Senate reject Warren, the first time since 1868 that a cabinet nominee had failed of confirmation, but Coolidge renominated him. Again the Senate rejected Warren. When the president offered him a recess appointment, Warren wisely turned it down. This was hardly shrewd conduct on the part of a president who had been so astute at politics the year before. Coolidge quickly learned to be more cautious. If his nominees continued to be generally conservative, they were also above reproach. Coolidge replaced one friend, Stone, in the attorney generalship with another, John Garibaldi Sargent of Vermont. The ambassador to Great Britain, Frank B. Kellogg, was appointed secretary of state, and the businessman Dwight F. Davis became secretary of war. Coolidge's cabinet was by 1925 his own. He either had men in it whom he wanted or had tested Harding's holdovers and found them acceptable. The exception was Secretary of Commerce Herbert Hoover. Although he was far from disciplined in Coolidge's eyes either in thought or in minding his own business, Hoover was brilliant, popular, and usually useful to his master in the White House. These two very different men would learn to live with each other, however often they vexed one another. Coolidge also shifted secretaries in the White House. With the 1924 election over, Slemp was replaced as chief secretary by a man of various talents, Everett Sanders, a former Indiana congressman. However one may assess the members of Coolidge's official family, many of them reached a high level of distinction. Hughes and Stone would become chief justices of the United States; special counsel Owen J. Roberts would also ascend to the Supreme Court; Dawes and Kellogg would receive the Nobel Peace Prize; Hoover would become president; and Interior Secretary Hubert Work and presidential secretary Sanders would become chairmen of the Republican National Committee. Moreover, Henry L. Stimson added luster to his reputation as Coolidge's special envoy by bringing peace to Nicaragua, and Dwight Morrow won fame for his remarkably effective embassy to Mexico. Coolidge was able to maintain his popularity with the public, to a considerable extent through his astute manipulation of the press and of platitudes acceptable to the people. The only president to have spoken more often in public was Theodore Roosevelt. Coolidge had acquired such a knack for speaking that even if few Americans felt uplifted, few were offended. He seemed always visible, dignified, and full of integrity, even if what he said was seldom memorable. Coolidge's chief problem remained his inability to bend Congress to his will. Yet he did have his victories, and for him they were usually the essential ones. In his annual messages to Congress between 1925 and 1929, Coolidge largely hewed to his original policies. He told Congress in December 1925, "The country does not appear to require radical departure from the policies already adopted as much as it needs a further extension of these policies and the improvement of details." His key policy was "economy and efficiency." If Congress could restrain itself from meddling in administration, which it largely did after 1924, the executive could provide efficiency. It was also Coolidge's task to persuade Congress not to get carried away with funding new programs or substantially increasing funds for established programs. In this he was remarkably successful. Appropriations remained low during the Coolidge years, and the officials of the executive branch used the funds allotted them well. With federal revenues constantly exceeding spending, the administration was able to cut the national debt substantially, confident that it was preserving the government's credit for a rainy day as well as curbing inflation. Neither federal economy nor paring the national debt was significantly controversial during the Coolidge years, but the corollary to these policies, tax cutting, was. Some members of Congress wanted to use the surplus to fund new programs; others charged that the administration's tax-cutting plan favored the rich. Coolidge and Treasury Secretary Mellon did espouse tax cuts that would benefit wealthy Americans, believing that the rich would invest their extra funds in ways that would increase production and therefore jobs and wealth at home. They also believed that this would expand American trade abroad, which would benefit the domestic economy and help stabilize the world economically and politically. The Coolidge-Mellon plan, which was an outgrowth of Harding's policies, was a clear illustration of the trickle-down theory of national prosperity. It seemed to work, as Coolidge's years in office encompassed a period of increasing prosperity for most Americans. Moreover, Coolidge and Mellon were careful to make sure that all American taxpayers were favorably affected by the proposed tax cuts. Indeed, not only were federal taxes reduced for all, but many low-income Americans wound up not paying any taxes at all by 1929. It is little wonder that, despite sharp debate on Capitol Hill, Coolidge was able to gain legislative approval of his tax program in 1926. Then Congress repealed the gift tax, halved estate taxes, substantially cut surtaxes on great wealth, and reduced income taxes for all. 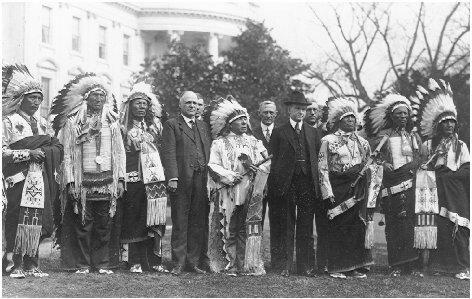 President Calvin Coolidge (wearing hat) welcomes representatives of the Sioux tribe to the White House in 1925.
issue, Coolidge could not avoid it. He was able to scatter support for the McNary-Haugen bill so that it would not pass, while he gained enough votes to advance federal support for cooperative marketing. In the same year, Coolidge also secured modest increases in appropriations for inland waterways, public buildings, and highway construction as well as additional funding for national parks and forests and Indian programs. It should not be overlooked that 1926 was the year that Coolidge and Congress approved initial funding for the National Archives. The president also astutely exploited the furor created by the court-martial of Colonel William Mitchell for insubordination to develop sentiment for orderly progress in civil and military aviation. The result was that Congress approved subsidies for the growth of the aircraft industry and most of Coolidge's recommendations for the coordination of military aviation and for the regulation of civil aviation. The president would not do as well with Congress in 1927 and 1928, partly because of Republican losses in the congressional elections of 1926 and partly because of growing support on Capitol Hill for programs that the administration found unacceptable. He persuaded Congress in 1927 to establish the Federal Radio Commission to regulate the use of wavelengths by radio stations, which had become chaotic. Besides that, in 1927 and 1928 Coolidge asked for some additional funds for public works and national parks and forests, improvement of existing federal farm programs, federal conciliation of labor disputes, and authorization of branch banking, all of which he received, but Congress refused to act on his proposal to consolidate the nation's railways. Coolidge won his chief victory in 1928 when Congress approved additional cuts in income taxes and reductions in corporation taxes. Besides taxes, the big domestic issues between president and Congress in 1927 and 1928 were the McNary-Haugen legislation, flood control, and public power development. Sentiment had been growing for federal purchase of surplus crops and the selling of them abroad at whatever price they could command. Although the administration offered an alternative proposal—to use cooperatives to extend cheap credit to farmers who would restrict their production—Congress enacted the McNary-Haugen legislation. Even Vice President Dawes championed the McNary-Haugen bill. Coolidge vetoed it in both 1927 and 1928 as unconstitutional class legislation that would benefit neither the nation nor farmers. It would, he contended, only encourage the growing of surpluses and the rearing of tariffs abroad to prevent the dumping of American agricultural commodities. Although much that Coolidge said was correct, the administration did not present an effective plan to deal with the nation's farm problems. Certainly, the administration's cooperative credit plan, which Congress finally accepted in 1929, failed to meet America's agricultural problems. A time-consuming and heated debate arose over flood control after the inundation of vast areas by the Mississippi, Missouri, and Ohio Rivers during the spring of 1927. The administration moved rapidly to provide relief and loans for reconstruction, but when this proved insufficient, pressure rose for a federal flood control program. Coolidge responded in December 1927 by asking for such a program along the Mississippi. He made a mistake by giving no specifics, and soon Congress was considering a $1.4 billion program instead of the $180 million one he had in mind. By April 1928 the fight between president and Congress had become intense. Only after great effort was he able to get the price marked down to $500 million and thus block legislation that would have jeopardized his stringent economic program. There was, moreover, the long-standing question of development of the Colorado River basin, which involved not only large appropriations but also the issue of private versus public control. After six years of work and debate, Coolidge finally approved in December 1928 the construction of Boulder Dam, which was central to the Colorado River basin development. He had artfully spun out the issue and passed on to his successor the spending of the $125 million involved as well as the controversial issue of whether the dam would be operated publicly or privately.